We host visitors by appointment, with our first availability at 10:00am and our last availability at 3:30pm. There are two experiences available to those who visit Titus Vineyards. To schedule your Titus Experience, feel free to create a request below, call (707) 963-3235, or email titusteam@titusvineyards.com. We happily host larger groups and private experiences. Please contact us directly for more information. Titus Vineyards’ Vista Room offers a stunning view of our 50 acre vineyard estate, showcasing the beauty and wonder of this valley of dreams. 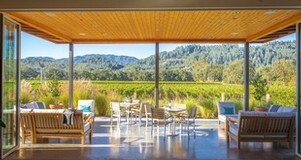 Each seated, semi-private experience is approximately one hour in duration, during which you will be guided through a curated selection of truly exceptional Napa Valley wines while gazing at the very vines from which the wines are made. Experience fees for one to seven people are $45 per person, waived per guest with a minimum three-bottle purchase. If you have a larger group in mind, please inquire for pricing and availability. 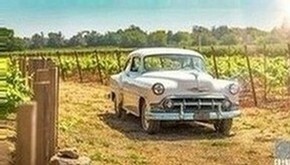 Explore the vineyard in our '53 Chevy Bel Air! You'll wind your way through the vineyards during this eighty minute experience, immersed in a world where life and farming were simpler, and where innovations such as the valley’s first wind machine made headlines. Taste current release wines paired with hand selected cheese and charcuterie in a country style al-fresco setting. Appropriate for two to four people, and conducted weather permitting in the fore-noon only, the experience fee is $75 per person, and $60 for Club Members. Please choose the experience you are interested in booking when filling out the form below.